As I evolve into the Sassy Chef, I am experimenting with a variety of recipes. 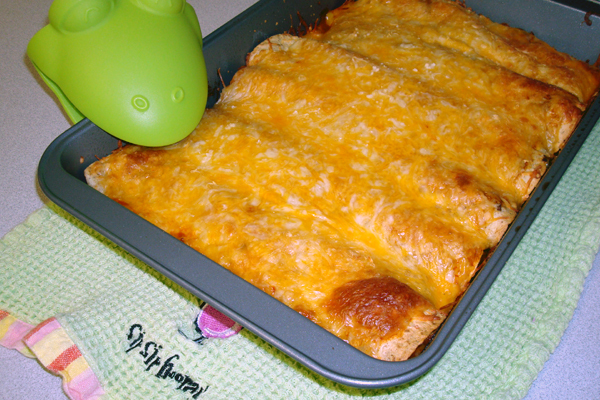 Because my BF loves Mexican but doesn’t like chicken, I decided to create clean eating enchiladas with beef. I originally wanted to make them with shredded beef, but my BF said ground beef was fine with him. He also suggested the taco seasoning. I call these “mostly” clean because the seasoning and enchilada sauce are standard grocery store varieties, with plenty of sodium and other funky additives. There are probably better options for these ingredients, either making them yourself or buying a higher quality version at Trader Joe’s or Whole Foods. So, how’d the enchiladas turn out? They were quite tasty! I didn’t know how my BF would respond to the whole wheat tortillas, but he liked ’em… enough to eat two that night and then two more a couple of nights later. Yay! I recorded some of the nutrition stats, so you’ll have an idea of the calories and fiber. I forgot to write down the other info, though; you’ll have to bear with me as I develop a formal process for recipe creation. It’s all quite new to me! Coat a baking pan with non-stick olive oil spray. Open the can of enchilada sauce and the bag of shredded cheese and set aside. Brown the ground beef in a heavy skillet until nearly cooked through. Add taco seasoning, stir, and finish cooking. While cooking the beef, warm the tortillas in the microwave, 30 seconds each. Remove the ground beef from the heat. Ladle one to two spoonfuls of enchilada sauce over the ground beef. Roll tortilla and push to one end of pan. Continue until all tortillas are filled. Pour the rest of the enchilada sauce on top. Sprinkle cheese evenly over the tortillas. Bake for 20-30 minutes or until cheese is nicely browned. Serve with salsa to taste. Makes 6 servings; approximately 420 calories and 15g fiber per tortilla. Entry filed under: clean eating, food review, recipes. Tags: eating clean beef, healthy Mexican food, low carb.